Also cited: A report showing that consumers' attitudes toward purchases of long-lasting manufactured goods such as motor vehicles and other big-ticket items hit their highest level since 2005. This year’s program, taking place on April 5-6, 2016, in Minneapolis, MN, promises to deliver new and invaluable information on ERP technology and how it can be used to maximize the growth and development of your company. Benefit from case-study presentations and witness demonstrations from key companies on what’s new and trending in ERP software. 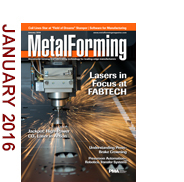 Industry analyst SmartTech Markets has identified several predictions for the metal-additive manufacturing industry for 2016. Among them: This will be the year when the automotive industry will make significant investments in R&D and indirect 3D metal printing. On Wednesday, January 20, at 2:00 p.m. EST, join Scott Schmidt, principal of Black Line Group, for a 1-hr. in-depth look at what many manufacturers already know—companies can avoid leaving money on the table by taking advantage of the R&D tax credit. Due to enhancements made by Congress over the holidays, significantly more American companies stand to benefit from the R&D tax credit in 2016. In addition to permanently extending the research credit, new rules laid out by Congress significantly enhance how taxpayers will benefit from their research tax credits. For manufacturers that have yet to take advantage of the credit, this can mean the creation of immediate and substantial amounts of cash, typically into the tens of thousands of dollars each year, as well as the reduction of future tax liabilities and improved cash flow. Also on the webinar agenda: John Guzik, from The Franklin Partnership, will provide an update from Washington, D.C., on the tax issues most important to manufacturers. In press brakes, crowning compensates for frame deformation. Manage crowning by knowing your steel and employing robust estimating and forecasting software. Two new coil-fed press lines--one progressive the other a transfer--help supply material to flexible robotic welding and assembly cells at Quality Metalcraft. The all-in approach to automation has led to significant growth for the one-time prototype/low-volume automotive supplier. Press Brake Operator 2nd Shift (IA) / Geater Machining & Manufacturing, Co.
Business Development Manager - Metal Stamping Industry (GA) / Clairon Metals Corp.